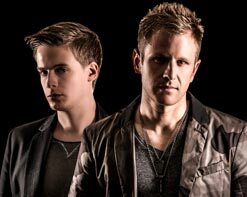 Watch a live performance by TRITONAL and you’ll understand the hype. The American production and DJ duo of Chad Cisneros and Dave Reed have firmly situated themselves as one of the most electrifying acts in the international EDM scene. Their zest for life and music is apparent to anyone who’s witnessed them in person or through their speakers and is just one reason why they resonate intensely with their loyal followers, “Tritonians.” On their newest single, “GAMMA GAMMA,” this Austin, TX based duo push the faders just a little bit louder and shake the floor just a little bit harder. Destined for mainstages and main rooms the world over, ‘GAMMA GAMMA’ sees the duo’s renowned innovation at its absolute best. Tribal vocal samples accompany yet another massively catchy Tritonal melody, built around robust bass and curving FX to result in a record so heavy it will have crowds jumping all summer long. They’ve created a video that draws inspiration from that same tribal aesthetic. A backpacking trio heads deep into the tropical forests trying to follow their own private sanctuary. They soon discover they’re not alone and the natives are not in a welcoming mood. Fortunately the universal language of music transcends the culture clash and the mood soon changes from captive to captivating! With a huge North American tour with Cash Cash just announced & their third studio album on its way, Tritonal still find the time to bust out a full-on dance floor destroyer with ‘GAMMA GAMMA” and we couldn’t be happier about the opportunity to work with the Enhanced Recordings team to bring you this exceptional single and video. Please contact Andy Gesner and the HIP Video Promo team at (732)-613-1779, email us at info@HIPVideoPromo.com for more info. You can also visit www.TritonalMusic.com/ and www.EnhancedMusic.com/.